Some suburbs in Indiana are waking up to the fact at their pattern of development is unsustainable in the most important way – financially. Hamilton County officials are closely watching new-housing prices, knowing that local governments’ long-term financial security could depend on it. If a residential development doesn’t promise homes with a high enough price tag, a municipality could end up losing money. That’s because, under the state’s property tax caps, lower assessed values might not generate enough tax to cover the cost of city services. No one seems to know exactly what that break-even price is–estimates range from $250,000 to $450,000–but most developers and government officials agree anything below $200,000 is no longer worth approving. This is presented as an artifact of tax caps, but those caps are simply doing the service of revealing early, while there is still time to do something about it, that the financial model of too much of suburbia is not sustainable on a long term basis. Indiana caps property taxes at 1% of a home’s value. That’s all the property tax money local government has to work with to provide all the services on which that property depends. Houses that are too cheap – and too cheap could mean as expensive as $450,000 – will not produce enough property taxes to sustain municipal services. This means housing for working class people isn’t going to get approved. This requires no recourse to racism, elitism, etc. to explain. Lower cost housing simply has a negative ROI for these communities. Maybe they can get away with building some lower cost housing that requires subsidies to support, but too much of this and a town will quickly be in real trouble. The problem is worse than these leaders know. They are in a favored quarter region that is still rapidly expanding in population, and every town here has physical room for more development. Cities that are newer or still in their growth phase experience artificially low costs because of the power of greenfield economics. Their building stock is new, liabilities are low, the population is well off, and by simple economies of scale alone they are becoming more cost efficient as they grow. But when they reach maturity and stop growing, costs escalate rapidly. This is why so many older suburbs around the country (paging Ferguson, MO) are in such bad shape, financially and otherwise. One way to solve the problem is to only build houses expensive enough to make the math work. That’s what Hamilton County seems to be doing. They are also smartly realizing that developers used to be able to offload infrastructure costs onto the municipality, and they are now making sure everything is paid for by the developer up front. But even a place without tax caps would end up like too many East Coast cities. They might in theory have a housing stock that would sustainably support a wider range of incomes. But in these towns sky high property taxes keep the working class out. This type of development, once the lifecycle phase of cheap costs is over, will send taxes through the roof, which we see in many places. These towns are ahead of the game in terms of coming to grips with the problem. Too many are not, however. They are simply approving developments pell-mell that are going to leave them saddled with massive future costs and a resident base that cannot afford to pay them. Of note: in Indiana, when property taxes were capped, the (extremely conservative no-new-taxes) state legislature allowed counties the option of raising local income taxes to make up for the revenue or projected revenue growth lost to the cap and the recession. They also allowed a special local option income tax for public safety. The Consolidated City of Indianapolis (Marion County, the metro area core county) exercised both options. Hamilton County has not raised its 1% local income tax. Yet. isn’t NYC about the same? only thing they are building here is luxury housing which almost no one can afford. Sounds like China and its housing bubble – they’re building seas of luxury towers but most people can’t afford them so they remain empty. No, the situation in NYC is totally different. Others have explained it. It’s kind of complicated but basically zoning is so restrictive that it’s not legal to build very much housing, and when it’s not legal to build very much housing, developers logically go for the top end of the market. Aaron, could one appropriate Hamilton County response be to increase density? I don’t know the area that well but my guess is there are many 1/4 ac or even 1/2 to 1 ac SF lots approved there. That strains any municipality’s ability to provide services over time. Do you think that moving from 2-3 du/ac to maybe 4-6 du/ac could make new development financially viable and lead to some affordable housing? One thing I must say so I don’t sound as if I contradict myself. Relaxing zoning in already dense but low vacancy cities (i.e., New York, San Francisco) makes sense. But I also often say relaxing zoning in dense or even sprawled cities with high housing vacancy rates (i.e., Chicago, Philadelphia or Indianapolis) is problematic since it will lead to accelerated high end housing development, geographically concentrated and lead to a net loss of affordable housing. But low density suburbs have far more space for development than they believe they do, and broadening their housing types beyond single-family homes can broaden their appeal. I believe they ought to consider relaxing zoning so they can escape the financial trap they’re entering. Bottom line is there is no one approach that all cities or suburbs should seek. Pete, Carmel is obviously trying that approach, raising density levels in the central district while preserving the subdivision feel to the east and west. Along with cultivating a commercial district of high end offices along Meridian, they feel this will give them the diverse tax base to survive long term. The other towns show little evidence of this. They want to build up town center area, but that’s only a tiny slice of their territory. Pete, Indianapolis’ new zoning code will allow densification in some single-family classifications (carriage-house or granny-flat second units). I’m optimistic that it might make for some more affordable housing options in areas away from the downtown core neighborhoods. So no, denser development in Carmel won’t lead to more housing that can be legally or colloquially defined as affordable. Suburban leaders and their most ardent supporters always want to artificially lower the cost of life in their sprawling towns. It’s always shocked me, because they tend to be the most conservative people, those who portray themselves as fiscally responsible. Manipulating the tax market, putting a cap on taxes artificially to make a place attractive, that’s some first-rate market intervention. Let these places get too expensive to be viable. THAT’S fiscal responsibility. That’s just like the federal money towns get/got to build their sprawl in the 20th century, except it comes from private pockets instead of public ones. The end result is the same; in 50 years, when those pipes need replacing, the money probably won’t be there for it. These people are learning nothing. I would think that making the infrastructure replacement calculations easy and routine would bring a moment of clarity to the process. People don’t just randomly put pipes and cables in the ground. The costs are known, at least to the engineers doing the necessary calculations. So why not make the lifecycle costs public knowledge with residents receiving a report of how much money should have been put aside and how much was in reality put aside. At least some of the time, the false “low cost” part of the cycle would lead to efforts to pre-finance these predictable expenses. I would expect more of the time, it would lead to private provision of services which are not a tax item and thus not subject to tax caps. Municipalities will need to learn what businesses know: even though depreciation is a “non-cash” item, if you balance your operating budget without setting aside money (profit or reserves) for replacement of capital items, you are not really balancing your budget. That’s the big issue with municipal finance. Would be great if cities would do that, but they don’t. The financial incentives that exist when the developer fronts the cost of added infrastructure are too alluring for any politician to care what happens long term. The immediate boost in property and income taxes from new growth is the easy decision when the bill for any real infrastructure maintenance doesn’t come due for a generation. Strong Towns has done several examples of typical residential and commercial development, all requiring massive tax increases far in excess of what would ever fit under the 1% provision in Indiana to maintain these places long-term. Rob Peter to pay Paul, and on and on it goes in hope for ever-increasing rates of lateral expansion. 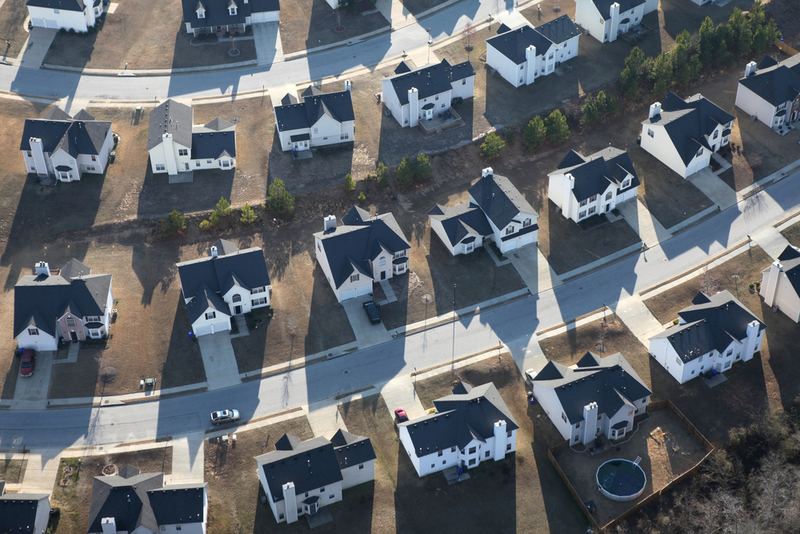 The suburban growth Ponzi scheme. I agree…today’s Ponzi scheme requires the mayor and council 20 years up the road to borrow money to replace infrastructure originally paid in developer impact fees. On the other hand, as I said above, it isn’t fair to charge existing residents and commercial property owners taxes to extend new infrastructure to new development…hence the one-off impact fees. The missing piece is setting aside some part of the new tax dollars in a replacement reserve fund. It isn’t that they CAN’T do that. It’s that they DON’T do that. The same thing happens on a much smaller scale if a condo association defers capital replacement due to fees being set too low…sooner or later, the replacement water and sewer lines, repaving, re-roofing and re-siding are required. The reserves (or the fee income needed to support partial borrowing) need to be big enough to fund it. The comments on this article are way smarter than the article itself! Yes, it’s true that a more expensive house will generate more tax revenue than a less expensive one (and the article’s author seems to be subtly approving Hamilton County’s recognition of this fact, and its responsive strategy of fiscal zoning), but the real problem — which the author ignores but which the commenters are happily pointing out — is not so much with the price of the house as with the size of the lot. Larger lots result in homes being spread much farther apart, which increases the per-house cost of serving those homes with infrastructure, whether it be local roads, pipes, power lines, etc. The solution (dare we say, the fiscally responsible thing to do) is to densify, in order to reduce those per-capita infrastructure costs. Incidentally, my organization, New Jersey Future, has just co-published a report with Smart Growth America on this exact theme — The Fiscal Implications of Development Patterns: Roads in New Jersey (New Jersey Future’s intro page is here: http://www.njfuture.org/2015/11/10/fiscal-impacts-roads-in-nj/) — one look at the scatterplots will show you just how expensive it is to provide roads to low-density development. Sounds great in theory. In practice, most of these high density locales have very high taxes and among the most exclusionary housing prices in the country (e.g., San Francisco). Find a dense place with conclusively lower costs and taxes over the long term, and I’m all ears. Many big cities like Chicago are fiscal basket cases, and NYC can’t even maintain its subways. You may say these come from bad governance. I agree. But bad governance appears to be endemic to these places. “In theory”? The scatterplots in the report I linked to, showing the relationship between density and per-capita pavement area, are based on real data. The point that I and the other commenters here are trying to make, and which the anti-city pundits seem determined to miss, is that the high-density places with exclusionary housing prices are vastly — VASTLY — outnumbered by LOW-density suburban places with restrictive development rules and corresponding high housing prices, and that the low-density places compound the problem by also creating very high per-capita infrastructure construction and maintenance costs (for which they implicitly expect to be subsidized by the rest of the state, by the way, via funding mechanisms that collect from everyone roughly equally). Why can’t the self-described “free-market” urban theorists for once turn their attention to large-lot zoning in the suburbs, which is a much more widespread and much more egregious example of market interference than Oregon’s urban growth boundaries or San Francisco’s resistance to increasing density? While increasing density may be the smartest plan, that often runs counter to the wishes of voters. Many folks here in Fishers are griping loudly about the new “downtown Fishers” development and the loss of green space. So, are there any good options for an older city that 1) is confronting the costs of deferred infrastructure maintenance associated with earlier periods of growth; 2) has relatively high housing prices and relatively high property tax rates; 3) wants to be more, not less, affordable for low- and moderate-income households? It depends whether the city has anything *but* housing. If the city is a pure housing suburb, it has no chance. If the city has some sort of sustainable commercial or industrial base, the answer is to build on that. Allow mixed-use multi-story development, and build a real urban core (apartments over shops, apartments next door to factories). TIFing everything to death and running cities (like Carmel, Indiana) as a cash cow for political cronies isn’t helping. Responsible government has left Hamilton County. That’s the real problem. Carmel’s budget is nearly twice Fisher’s. There’s plenty of money. Having recently come from an affordable housing seminar a few works ago in Hamilton County, in the break out seccesions, there was a consensus that rather than the price of a home many other factors play into the sustainability of a community. The neighboring community to the west of Carmel is known for its large estate homes and has some of the highest taxes of donut or ring suburbs. What is more important is the mix of quality commerical and a high paid work force that helps supplement infrastructure with a number of taxes. Carmel’s neighbor to the East has all but used the C word (Carmel) in using Carmel’s vision and TIF to develope a higher density core that attracts commercial, workers, employers, and housing for a variety of citizens. In a county that has recently seen some of the most explosive growth in the country, the light bulb is coming on that housing alone no mater the price point is not sustainable for the long term. Without price appreciation and indexed taxing this growth is a recipe for disaster. Economic segregation seems simple enough except for the fact that this is Indiana…not exactly a high or growing income state. So not only are taxes capped, these home prices are starting out essentially capped as well and have little room for price appreciation in a level income/rising interest rate era. My issue is that per the census there is a very small buyer pool available for these future builds all the while the massive infrastructure they have financed ages: the high starting prices essentially limit the tax caps ability to grow it’s fund. Forget all of the “lowest cost of living living” accolades. The median income for a household in the county was $47,697 and the median income for a family was $95,376. Males had a median income of $67,221 versus $44,273 for females. The per capita income for the county was $38,500.